When you talk about Austin/TX, you talk about the passion for the music. And we are addicted to music and gear. We live and breathe them day and night. Inspired by this passion, Austin Guitar House was created to offer the best selection of high end/premium guitars, amps, effects and accessories. We believe that good music requires great instruments with outstanding playability, reliability and aesthetics. That’s what you will find here combined with friendly and personal service. Welcome to our house - step into our living room ! 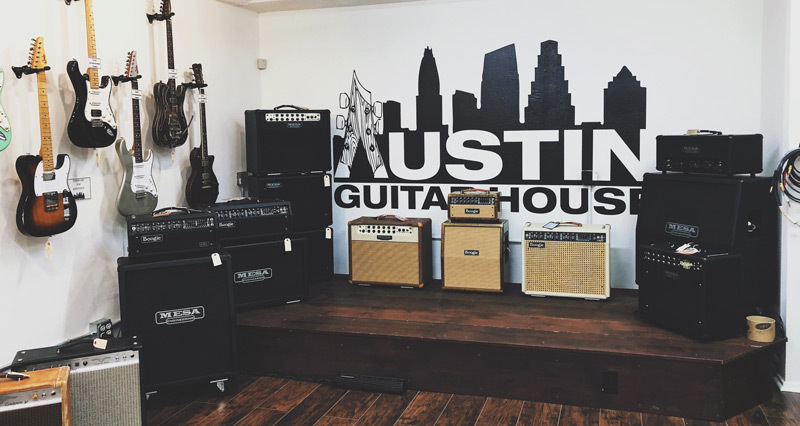 Located in a quaint building in downtown Austin, AGH focuses on high-end boutique gear, and trying to get smaller brands and non mass produced instruments into peoples hands. Whether you're a novice or seasoned pro, you are always welcomed in our living room! We deal with all sort of customers. One of our best was the late, great Walter Becker. We have also had a number of other great players swing through or purchase from the shop. Including Cliff Williams (AC/DC), Doyle Bramhall, Carter Arrington, King Zapata (Gary Clark Jr) and many others. We deal a lot with the local artist in Austin. Which you can probably imagine is a lot, being the "Live Music Capitol of the World". And being that we deal with a lot of high end, seldomly seen guitars, we have a lot of collectors we deal with as well. We notice that, while a lot of people now a days shop on-line for most everything, when shopping for higher end gear, people still want the personal touch that comes with buying from a small brick and mortar shop.